You may wish to transfer your system as a whole from one region to another region. For example, you may want to move from an on-premises data system to the AWS system, or move from one region of the AWS Cloud to another region. You want the transfer to go as smoothly as possible, of course, without changing the domain name of the system and without having to take the system down. In transferring the system as a whole, without changing the domain name, there is a technique where the "Weighted Round Robin" function within the Domain Name System (DNS) server is used to switch from an existing system to a new system when performing name resolution. At first, you allocate only a small portion to the new system, and then, if there is no problem, you increase the distribution to the new system gradually. 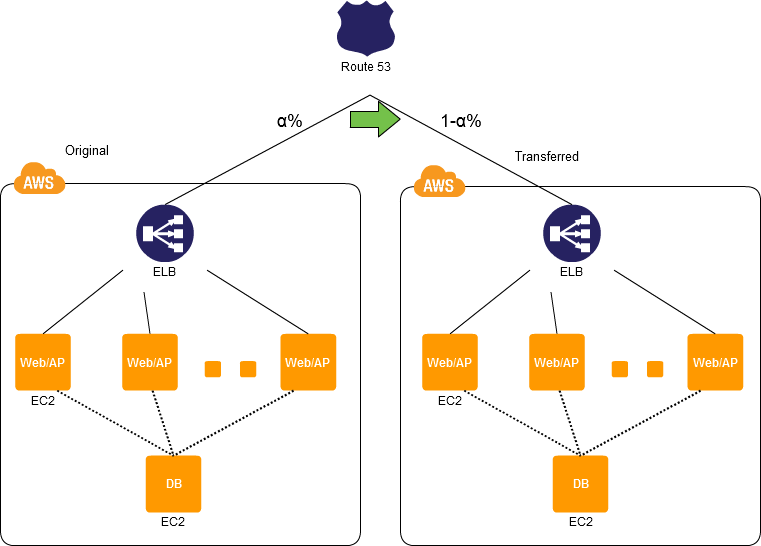 You can use the DNS service provided by AWS to set up the Weighted Round Robin easily, thus letting you perform the transfer operation without having to think much about the operation of the DNS server. You can transfer the system using the Weighted Round Robin function in AWS Route 53 (a name resolution service). Create a record set for the existing system in a Route 53 hosted zone. Provide a new system with a structure that is identical to that of the existing system. Create a record set in the new system within a Route 53 hosted zone, and set up the weighting. Initially make an extremely small allocation to the new system (for example, 1%), and if the system operates without problems, gradually increase the weighting until ultimately the weighting switches over entirely to the new system. This lets you transfer to a new system without modifying the existing system. Because this lets you switch to the existing system while controlling traffic, it also lets you switch back immediately if there is some sort of problem. If data synchronization of a database is necessary at the time of the transfer, you have to think about that separately.